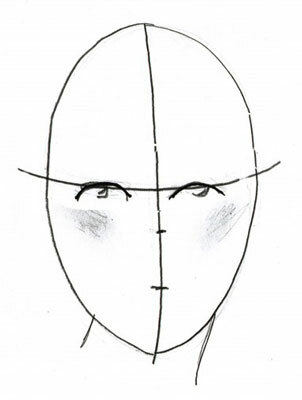 Start with a basic oval when drawing a head for your fashion drawings. Take a look at your head in a mirror. Ignore your facial features and hair, and see that your head is longer than it is wide — the definition of an oval. You can also think of the head as a large egg shape. Next, draw a face grid on your oval. Face grids have nothing to do with sports. A face grid is is a fancy term for a simple drawing tool that helps you establish the placement of the features of the face — you just draw horizontal and vertical guide lines that cross at the center of your oval. The vertical line is a line of symmetry that marks the center of the face (down the nose), and the horizontal line is the figure’s eye level. Mapping out a face grid gives you a starting point when you’re looking at an empty oval that needs to be turned into a face. You don’t use measuring tools to place the facial features; just eyeball everything. Some people prefer to curve the guide lines slightly, following the oval’s natural curve. A slight curve to your face grid adds dimension so that the facial features don’t appear to be rigid or flat. A slight curve gives facial features a more active feeling. The eyeline is halfway down the head, so keep the horizontal face grid line in the center of the oval, or you’ll end up with eyeballs on the forehead!